Offer plenty of treats for your fondue party. Having friends over for fondue is a festive theme for a get-together. The advantage of a fondue party is that your food can also serve as your decorative centerpiece. Prepare for your fondue party by creating table settings that celebrate the fondue theme and give your guests the tools they need to dip their favorite foods into various types of chocolates and cheeses. Even a fondue party calls for some table setting basics. At each guest's place setting, include a large plate, which she can fill up with tasty treats to dip in the fondue. Each guest will need a fondue skewer as well. The skewer can double as the place card for each guest. Write each guest's name on a piece of card stock, punch a hole in it and run a ribbon through the hole. Tie the ribbon around the skewer for a fondue-themed place card at each place setting. 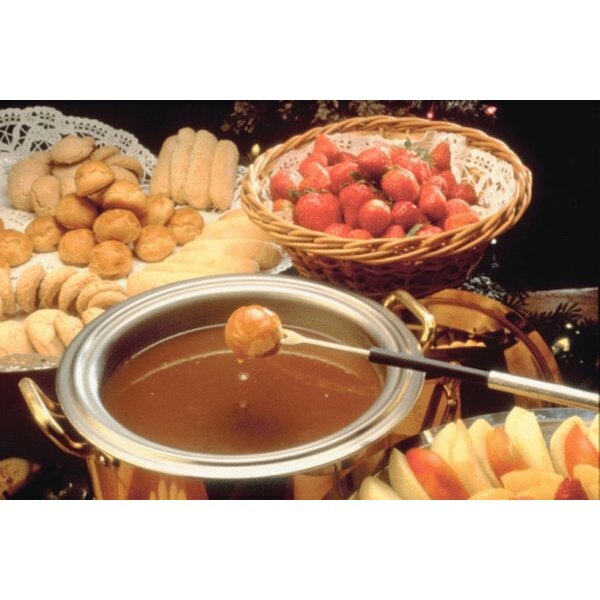 Fondue pots serve as the centerpiece to your event, and you can dress them up for a fun decorative twist. Run fondue pots down the center of your table, if you're having a seated party, or scatter them throughout the room if you're having fondue stations. Cover the tables in brightly colored linens. 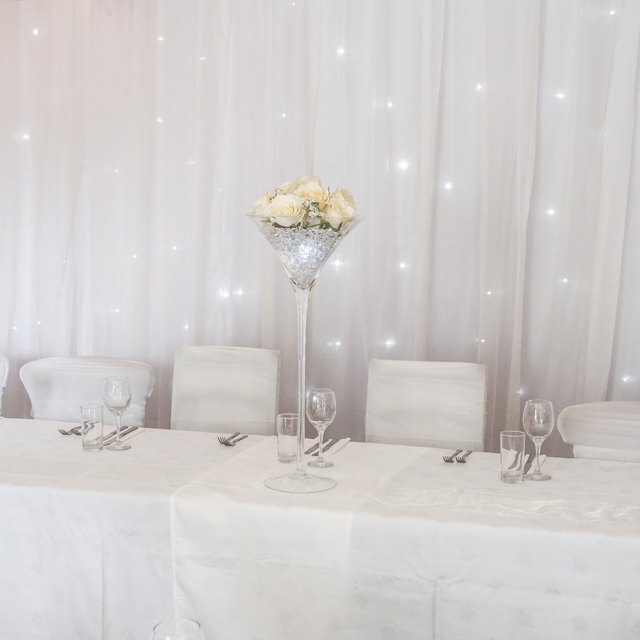 For an added visual effect, you can include sturdy boxes underneath the linens so that you can place fondue pots at different heights for easy reach. Colorful, individual-sized bowls can be a useful and fun addition to your fondue table settings. Give each guest a set of two or three small matching bowls -- choose from festive patterns or solid colors. Fill each bowl with some of the items available for dipping -- you might include bread in one bowl, meat in another and sweets such as fruit in the third bowl. Guests have individually portioned food, which they can dip in the fondue pot of their choice. Including a list of fondue rules can be a practical -- and humorous -- way to maintain food safety during your fondue party. List practical rules such as "Don't touch the fondue skewer with your mouth" alongside more humorous -- but equally practical -- rules such as "Let the fondue drip off your food to avoid unnecessary stains all over your clothes." You can also list the foods available in case any guests have food allergies. Print these rules on a 3-by-5-inch sheet of card stock, with the name of your event, such as "Kim's Fondue Fiesta" at the top. Include these rules at each place setting.